kayu wrote: The mental fixation with fin clusters on this thread is bizarre..... probably because there's not many well made singles out there theses days. Not really Kayu. I know of someone who would could make me a single that would be absolutely out of this world. Im so tempted and thought long and hard about it. Trust me I did. IF I ever went to bali would I take a single, probably yes if I got one from him, but only from the man. But would I take a quad, oh lordy yes, within a heartbeat. Again, I love how a single rides, the lines are pure and beautiful, I also like how a quad rides, its personal. Thoughts are leading toward taking 4 boards. Just need a bigger bag. Just stumbled across this thread I started a while ago. Sold the rabbidge thruster, and the 6'4 quad father. 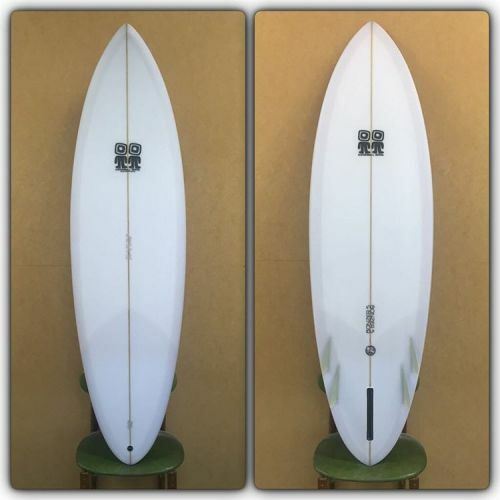 Bought a 6'7 miller semi gun, 6'2 bonzer mini Merk, and PCC 6'0 Tri/quad. Think I'll leave the 6'1 single at home if I can find a nice 2+1 before I go. There's no time for PCC to do me a custom so would need to be off the rack. Any ideas? Not many people stock 2+1's where I live. Called Finbox, the shop next door, both don't have anything that suits. What about a 6'7 Russ Short Bonzer - 5 fin. Rounded Pin. Great step up?? Where could I get one at short notice though. Not many in Sydney after Malcolm's last trip. 20.5 but its got a decent single bag if you want that..
Pm me if you interested. Am not desperate to get rid. Have you posted pics in another thread before? Would love to see it? Swap ya my mini merk? No single fin option but forward outline thicker foil up front. Quad version? JET01 wrote: Have you posted pics in another thread before? Steve, I wasn't but thinking about it. For the waves I mainly surf it would be better as a quad or thruster option for me, beautiful board but not enough use. it says full speed top to bottom surfing on a 6-8ft hard offshore day at the point.